Snowman by Li Jinghu is a site-specific installation and event that takes a lighthearted approach towards the consumption and distribution of everyday consumer products. Using everyday items such as packaged toilet paper, Li creates a larger than life size snowman, which will steadily ‘melt’ over time as the items are sold off at bargain prices. At once sculptural installation and interactive event, Snowman explores the intricacies of pricing, buying and selling of everyday goods within a localized setting while transforming Arrow Factory into a temporary shop for salt, washing powder and cheap low-grade toilet paper. Effectively relocating a wholesale market from the remote outskirts of town to the city center, Snowman attempts to infiltrate and disrupt the local economy by introducing wholesale prices amongst a growing retail environment. Taking up his earlier concerns with the formal qualities of everyday objects, here Li selects only white color products and sculpts them into snowmen—a whimsical and imaginary form for the artist, whose first encounter with snowfall occurred just days before he began his installation. However, as in real life, snowmen are not intended to last. The artist has engaged the assistance of a neighboring shopkeeper to sell the items everyday for approximately one month until the snowmen gradually disappear. 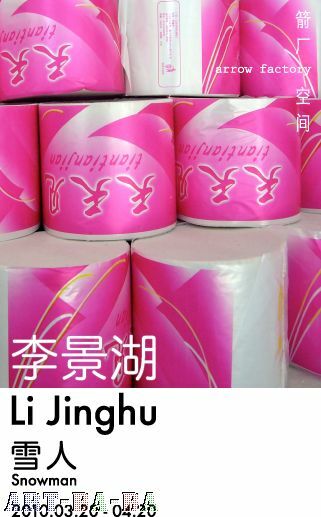 Coincidentally, the brand name of the toilet paper Li purchased is called 天天见“Tian Tian Jian” (literally ‘seen everyday’), a phrase which speaks to the work’s two conceptual edges: the fleeting, ephemeral presence of snowmen and unfaltering daily encounters with these common products. Living and working in Dongguan, Guangdong, one of China’s infamous ‘world factories’, Li Jinghu’s artistic practice is highly informed by his own upbringing, everyday experiences and imaginations within and beyond this southern industrial city. Having witnessed the changes that have occurred in the region—from reform and opening until the most recent economic downturn—Li has developed a keen interest in the patterns of daily existence and the lives of ordinary citizens that surround him. 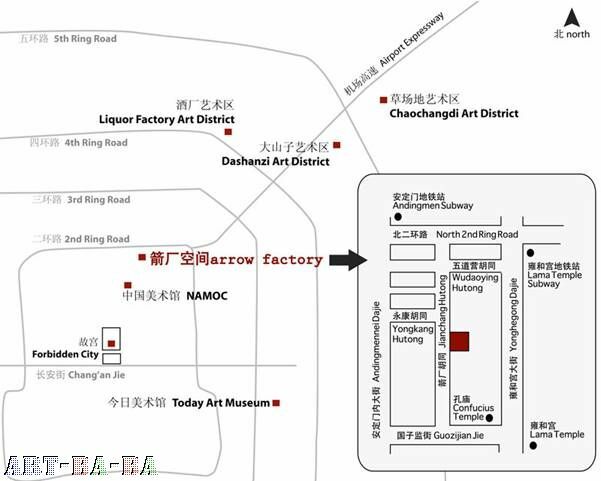 Arrow Factory’s hutong is a fitting location for an artist who has grown accustomed to working away from the art centers of Beijing and Shanghai, and whose practice seeks to melt away the borders between art and life.